When connecting speaker wire from a receiver or an amp to your speakers, banana plugs are far easier and more reliable than the old "strip and twist" method. 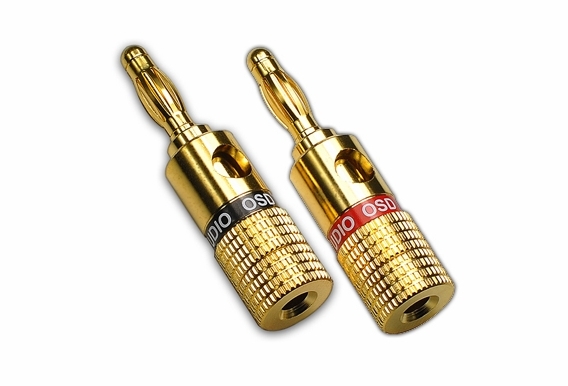 So named due to its banana-shaped prong, banana plugs are also frequently used to test electronic equipment. 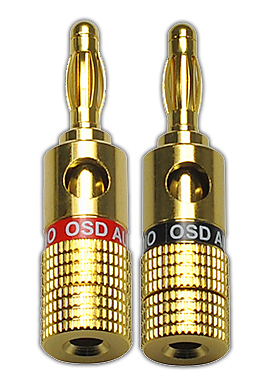 OSD Audio speaker banana plugs are very sturdy, and the gold plating provides a reliable electrical connection. 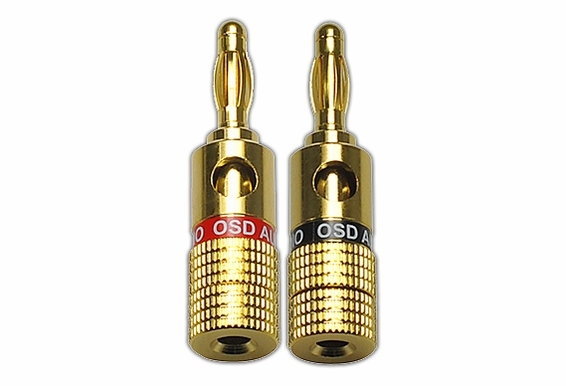 These banana plug speaker connectors are made from pure copper, which sets them apart from cheaper products on the market. 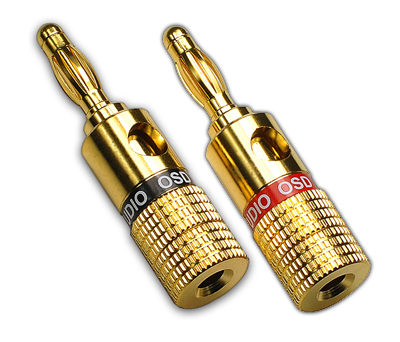 Buy only the best audio banana plug for your home speaker system from Outdoor Speaker Depot. Note: The banana plug is the male version of the plug. The banana jack is the female version. Do speakers typically come equipped with banana jacks? Hi, Can you please tell me how good a conductor are those 'berillium springs' in comparison to pure copper, (IACS) and do they conduct well on these plugs? Best regards. Fraser. Does the speaker wire install into the hole in the end or the hole in the side, or either way??? What is the advantage over these compared with product # OSD-HB-002? (which are less expensive) Both are "Pure Premium" and the other is more compact... which I'd figured is advantageous in some ways.